Friends I am doing something new! Today I share about an upcoming podcast series called LifeLine in which I share practical ways to help you discover your own story and illuminate the extraordinary within. Although The LifeBeats Project was only launched a little more than six months ago, it has truly been years in development. I have absolutely loved what I have been able to do so far with it. I hope you can feel how much I love what I get to do, through my microphone. People are amazing!! You are amazing!! But there is so much more I can do to help you see that. After months of trying to figure out how I can do that better and share my passion of your extraordinariness with you… after talking with business and social media experts, my friends, family, and especially my wise husband, I have decided to implement something new starting this week. As I have struggled to know where to begin, I will share a podcast I did in my car, that shares how one listener’s comment put a neon sign up in my mind on where I should start! 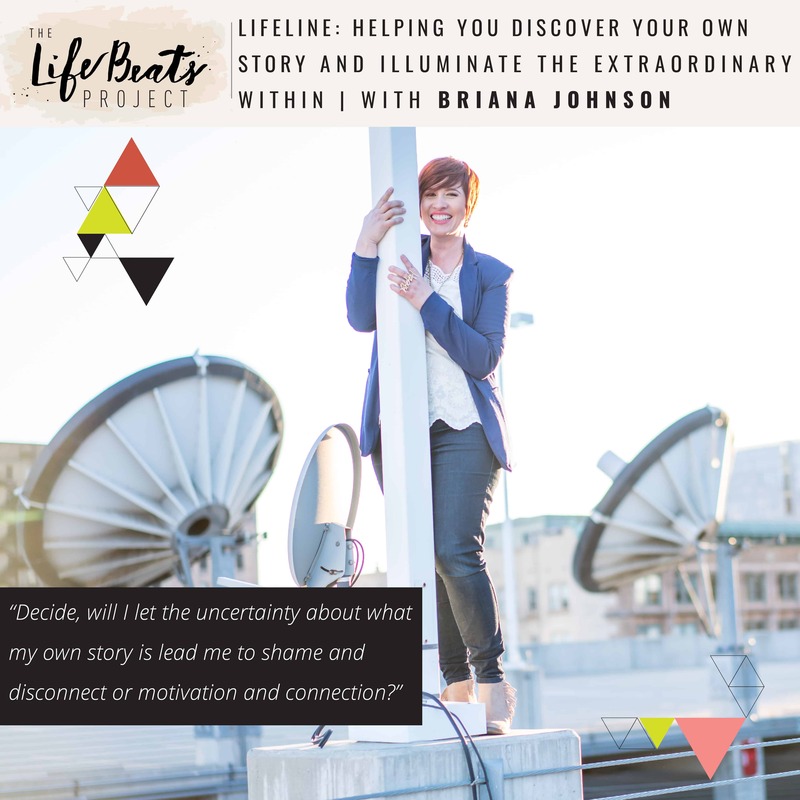 Today I share how The LifeBeats Project began, what its purpose is, who it is for, what LifeBeats are, and the levels of involvement you can have in the discovery and expansion of your own story through the podcast. I share why our community is so important as we are all at different stages in our self-acceptance and self-awareness. And how those who are uncertain about what their own story is have an important decision when they listen to others’ stories, either one of shame and disconnection or one of motivation and permission to let people in. Come learn about what to expect from the series and how we will work towards a fullness of life. I am clear that this journey to self-love does not lead us to a life of self-absorption but one that full through the serving of others. I can’t wait to share these messages with you!!! I will also share more about my opportunity to speak in an upcoming women’s retreat, contribute to a book, and the launch of a new social media campaign to allow everyone who wants to share their story an opportunity to do so!! I am sooooo excited to give more of you a chance to share your story, actually anyone who wants to really!. As of right now I am able to only share one story a week with you on my podcast. I’ll never get through tell the stories of the world that way so here is my chance. I would love all of you to briefly share a piece of your story on Instagram or Facebook, whatever that looks like. And then share what this has taught you about yourself and how has it changed the way you see yourself and the world around you. Share it in writing, share it in a video. Take a photo of yourself holding a sign saying #lifebeatsforme. Write your own or download mine straight from my website www.thelifebeatsproject.com Lets be the spark to break down barriers between us, fight the urge to not share, you are so worthy of inspiring others with your story. You need to recognize its worth and they need to hear it. Allow the LifeBeats within you a chance to reach out to others and to connect and resonate with the LifeBeats of others. What you have gone through, what you are doing now, the good you are doing in the world, the struggle you are currently in, your own journey is worthy of inspiring others right where you are. Be sure to tag your story with #lifebeatsforme and @lifebeatsproject so that myself and others can find them. Each Friday I will be selecting one of your stories to share on my Instagram and Facebook pages. I cannot wait to read your stories. The world needs you. Want to know if this episode it for you? This episode is perfect for someone who struggles with knowing their own story or their own worth. It is perfect for someone who is ready to discover what it is they have to offer and want support and help to do so. It is also wonderful for those wanting to know more about The LifeBeats Project, how it began, who it is for, and what LifeBeats are.